The birth of Ebb & Flow came very naturally as the founder, Ty Bramwell, had always dreamt of sharing meaningfulness and joy. The creating started with her fascination of crystals, which came at a later age. She had a vision of sharing simple, minimalist, raw crystal jewelry. Ty launched the first Ebb & Flow jewelry line within a boutique in mid 2014, and never looked back. Within a year, the beginning of the apothecary line launched. "It was simply intuition," says Ty, for the apothecary quickly became Ebb & Flow's defining line. The first apothecary products were synergistic essential oil blend perfumes, which were crystal infused. 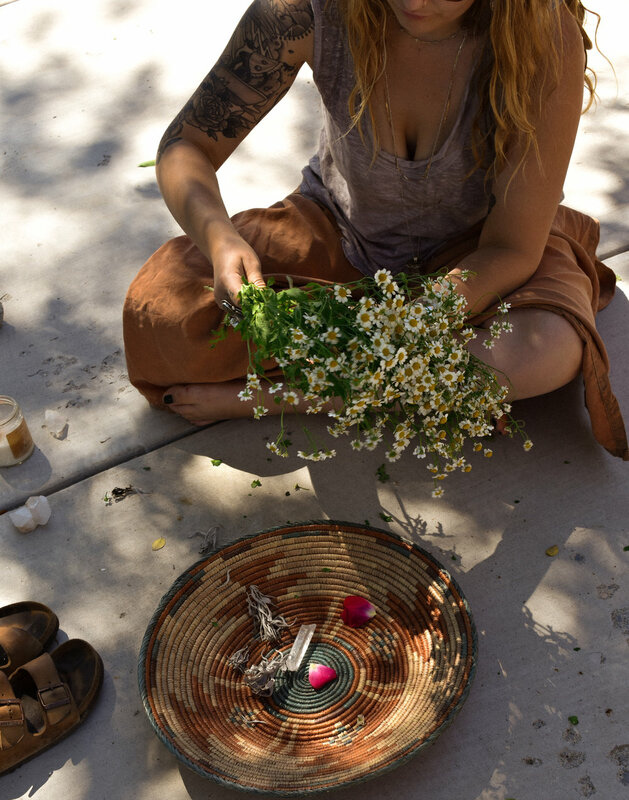 Ty’s love for natural, organic products and her expansive knowledge of the physical and metaphysical uses of herbs, she gathered not only from time spent in Morocco, but also from many inspiring people and role models throughout her lifetime; such as herbalists, medicine men/women, healers, and shamans. These ideals were applied to her daily life, but when realizing she could be a bridge between mindful ideals and practical routine based products, it awoke wisdom and became her life. Ty is a free spirited, flowy presence who has been marching to her own drum, and following her own set of rules since birth. She graduated with a BA in English with a concentration in creative writing from the University of Iowa. She started what became Ebb & Flow in her last year of school there and nurtured it without thought, as it was a direct reflection of what she needed in her life at that time: love, healing, & something to believe in ~ she was born in Sacramento and now resides with her partner Adam, dog Blue, cats Bruno and Jim Morrison, and goats Dottie, Fawn, Opal, & Bodhi on their ranch in the eastern Sierra Nevada Mountains. Ebb & Flow creates organic apothecary, candles, & jewelry, by hand, in small batches using ancient processes. Bohemian meets the sand meets the desert, with meaningful designs, stories, and vibes. Deemed, "the brand for boho-style beauty," by nationwide beauty retailer, Riley Rose in 2018, Ebb & Flow has rapidly grown a reputation for producing quality, mindful products all tailored to natural, stylish, meaningful beings. Since launching, Ebb & Flow has been picked up by Free People, Riley Rose, Dolls Kill, Forever 21, and many more vibin’, conscious boutiques throughout the country; which has brought the accessibility higher than Ty could have ever dreamed. Ebb & Flow has also been featured in Vogue, Disfunkshion Magazine, Bohemian Collective.